This article shows you the way to bring Redmi Note 5A into Test Point mode which is formerly known as Emergency Download (EDL) mode. Despite it is an advanced method, some users still prefer to use this technique to bypass the need of officially unlocked bootloader. There might be a situation when your device got bricked or in the bootloop state, but the bootloader has not been unlocked yet. Hence, this situation will force you to deliberately use the Test Point method. It would be impossible to unlock the boot loader since the device is bricked or is bootlooped. In short, EDL mode is also known as an emergency mode for mobile. Technically all the Xiaomi devices come with EDL mode option. If you want to install or update your own Xiaomi or Redmi phone then you have many options to flash new stock ROM on the device using Recovery Mode or using fastboot mode. Both methods have some limitations like Recovery ROM can be used only to update higher version and you can’t downgrade Xiaomi version. The Test Point method is indeed the best and most effective solution to overcome Xiaomi devices that experience Bootloop cases to Hard Brick in Locked Bootloader conditions very easily but with a very large percentage, it’s just that to be able to use this method you need to open the lid behind your Case Redmi Note 5A to reach the point where this Test Point is located. Important! 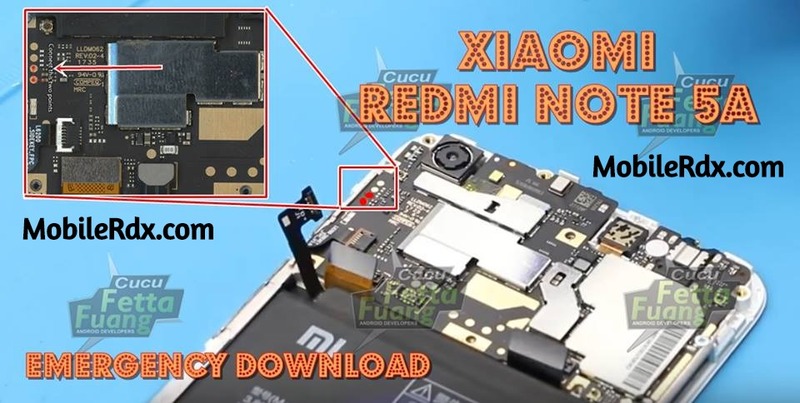 – For all of you, you know at this time you can’t flash firmware on Redmi Note 5A, because currently there is a lot of circulating Xiaomi Redmi Note 5A with fake Bootloaders, so if your Bootloader is fake with indications.then you can’t Flash the original firmware for Redmi Note 5A then your device will be permanent brick, for that you first check what Codename Bootloader Xiaomi Redmi Note 5A is, original or fake. Once you are able to remove back cover, disconnect the battery connector first. Battery not required for EDL mode. Now remove the black tape to visible the edl points of Redmi Note 5 pro. IMPORTANT: Most of the other Xiaomi phone’s edl mode points are visible but in Redmi Note 5A it comes in hidden mode. Reasons are not disclosed by Xiaomi. But you can visible these test points by removing the black tape. After removing the black tape you can see two test points easily. Now EDL mode or Redmi Note 5A edl test points are in front of you. And you can use them to install firmware on Xiaomi Mi 6 without unlocking the bootloader.